This one of a kind house is a real attention getter! Located on Lakeshore Road in the heart of Union Pier, Barefoot Beach House is a truly stunning 8 bedroom 9 bathroom compound right on Lake Michigan. Comprised of a main house and a recently added carriage house, this is one of the largest lakefront properties available in the area. Guests will first encounter the carriage house, which lies at the front of the property. Upon entering the turret on the main level, guests will be awed by the enormous antler chandelier overhead and the circular balcony overlooking the entryway. From there guests move through a small seating area into an open concept living space with the only divider between them being a floor to ceiling, double sided, stone fireplace surround. The kitchen is fully equipped with stainless steel appliances and an extra-long countertop which doubles as a breakfast bar to handle any overflow from the six person dining table. Down the hall from the kitchen is a powder room and a laundry area with a washer and two dryers. There are four bedrooms within this wing of the compound, all located on the upper level. Each bedroom has a marble tiled en suite bathroom. In addition, each enjoy fantastic views, including from the loft area which have a strategically placed sky light. The first bedroom is furnished with a queen bed, an additional queen bed in the loft area, and a door leading out to the balcony within the turret. The second and third bedrooms are each furnished with a queen bed below and two twin beds in the loft area. Each of these bedrooms have a door leading to a deck. The fourth bedroom is furnished with two queen beds and adjacent twin over twin bunk bed. Guests will appreciate the extensive views from the carriage house through the set of large folding doors which open fully to the expansive outdoor patio/pool area. Guests will also find the geothermal heated stone floor, the overhead lighting, which is cleverly inset into the beautiful wood ceiling, and the multi-room indoor/outdoor audio system appealing. A hallway connects the carriage house with the main house. This hallway houses a built in grill station with extra burners, a sink, warming drawer, and an under cabinet fridge and ice machine. Smoke from the grill is no problem as there is a built in exhaust fan nestled in the copper paneled ceiling and another set of large folding doors which also open fully to the patio/pool area. From the connecting hallway, guests enter the main floor of the main house. The kitchen, dining, and living areas, as well as three of the four bedrooms, a powder room and two bathrooms, are located on the main level. Like the carriage house, the kitchen is fully equipped with stainless steel appliances including a huge side by side refrigerator. A spacious black granite island offers plenty of counter space including seating for three. A big rustic table provides ample seating for twelve and an adjacent smaller table provides additional seating for four. Comfortable couches are available by the the dining tables and also directly in front of a wood burning fireplace. Wall to wall windows from which to enjoy beautiful views of the outdoors as well as multiple doors from which to access the deck and outdoor patio/pool area provide an outdoors-in experience. An additional small seating area is situated by the front door where guests have access to a great many books and games. One bedroom is located near the front door and contains a twin over twin bunk bed, an en suite powder room, a bench perfect for reading and lots of children's books and games. The second bedroom is off of the dining area and is furnished with a queen bed and en suite bathroom. The third bedroom is off of the living room and has two twin beds and a crib. The other full bathroom is located in the hallway next to the third bedroom. On the upper level guests will find a huge master suite furnished with a queen bed, sitting chairs, wood burning fire place and a second crib tucked away in an alcove. French doors lead to a magnificent marble tiled bathroom with an enormous step in double shower and a door leading out to a deck. On the lower level guests will find a laundry area and extra refrigerator and an additional bathroom. As if the indoor space of this home was not amazing enough the outdoor area will blow you away. 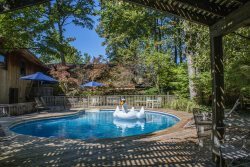 The extra large patio area with huge mounted flat screen TV is viewable from the 7ft tall waterfall pool with slide, which both adults and children alike will truly enjoy. A set of stairs lead up to the in-ground hot tub and adjacent pond stocked with goldfish. Atop the bluff guests have extensive views of Lake Michigan, and if all that were not enough to keep you busy, the private beachfront awaits you at the bottom of the stairs. Perfect for large groups or families, this lavish home offers a vacation to remember!